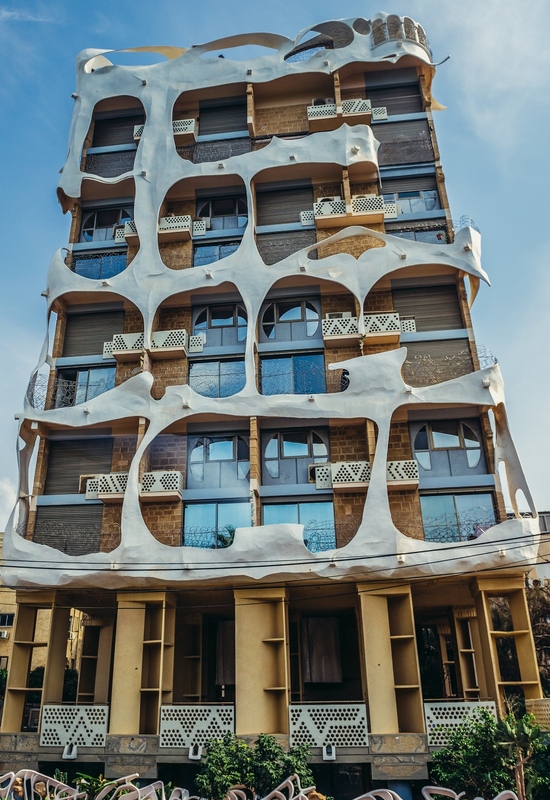 Ranging From Unusual to Daring to Strangely Appealing, These Extraordinary Architectural Eye-poppers Show the Quirky Side of Israeli Creative Genius. The austere “less is more” mantra of architecture in the first half of the 20th century gave way to the postmodern “less is bore” approach that said buildings could be both functional and artistic, even incorporating elements of irony and asymmetry. While “less is more” defines the famous White City Bauhaus buildings that earned Tel Aviv a UNESCO World Heritage Site designation, the “less as bore” approach in Tel Aviv and other Israeli locales led to structures that have people stopping in their tracks to gawk, grin or gasp. Are these buildings beautiful or baffling, or both? That’s up to you. Beauty is in the eye of the beholder. 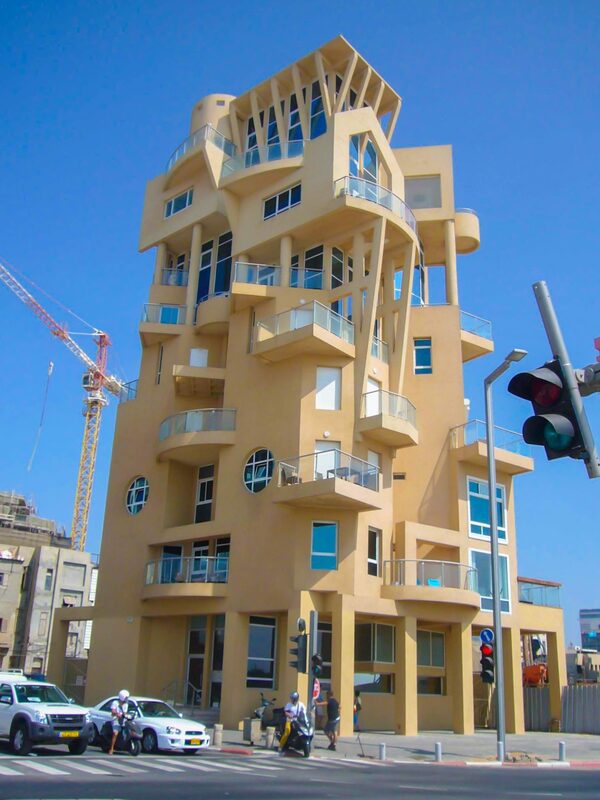 Let us know what you think about these examples of daring Israeli architecture. French-born architect and interior designer Ephraim Henry Pavie planned this 10-room, four-story house for his own family in 2007. It’s not completely finished because he’s always experimenting with the design. His teachers warned that if he wanted to graduate he’d have to sketch rectangular buildings like everyone else. But once his diploma was safely in hand, Pavie and a few friends built two feng shui-inspired bubble houses in Paris in 1974. “The technical approach we developed allowed us to build free shapes. 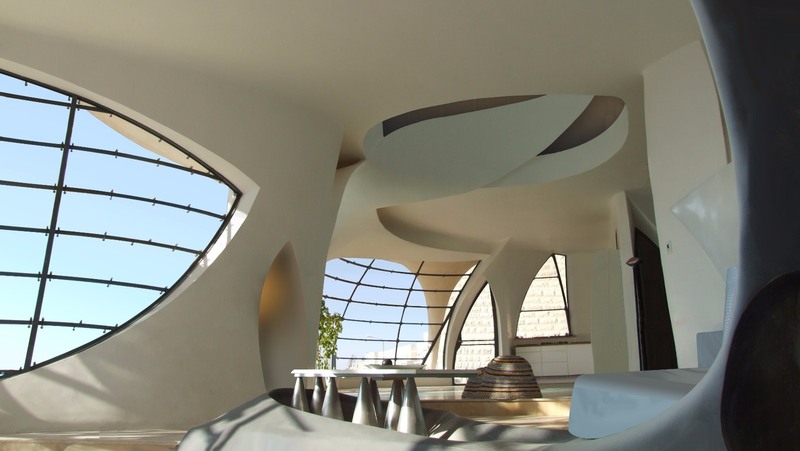 The structure is flexible and when I’m sure everything fits the way it should fit I spray concrete on it,” says Pavie, who has also built bubble houses in Miami and on the French Riviera and is completing another one in Israel. Every component, including the windows, is custom made onsite. 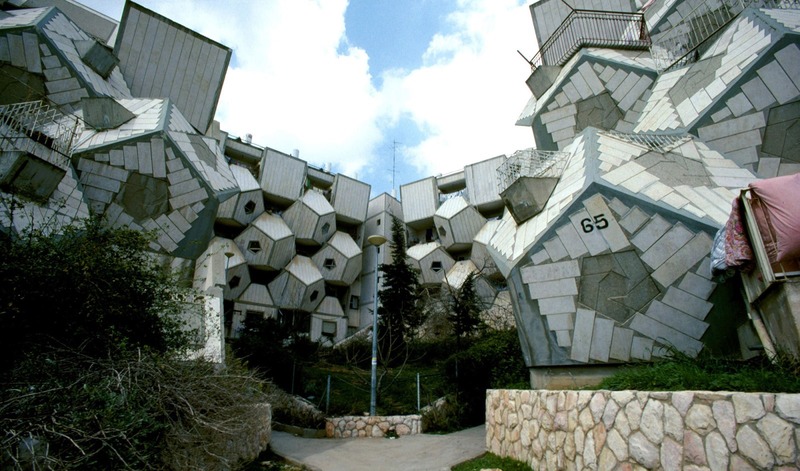 Israel Prize-winning architect Zvi Hecker designed the northern Jerusalem neighborhood of Ramot Polin as an enormous grid of pentagonal (five-sided) units. Completed in 1975 and since expanded upon, Ramot Polin’s 720 apartments zigzag around inner courtyards. 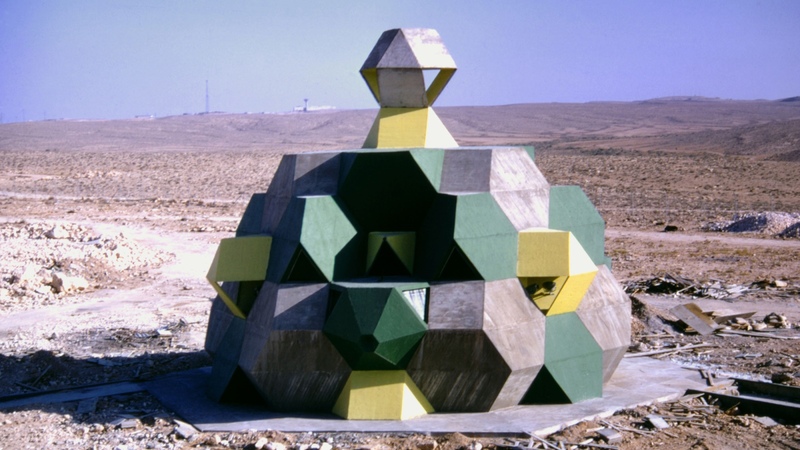 Similar geometry is seen in Hecker’s Synagogue in the Negev, where three types of polyhedral units comprise the truncated octahedron building. 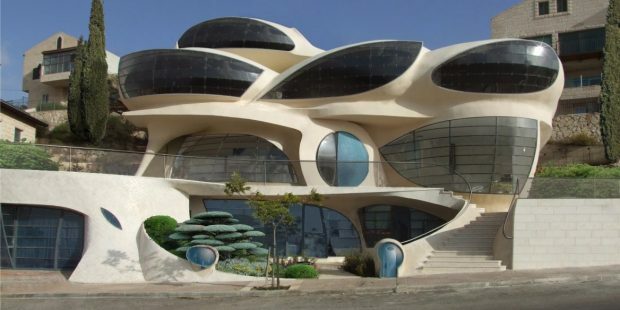 The internationally prolific Zvi Hecker also designed this twisty house, which took five years to build, from 1984 to 1989. The facade of plaster, pink glass, stone fragments, corrugated tin and mirrors reflect the interior courtyard and the surroundings. 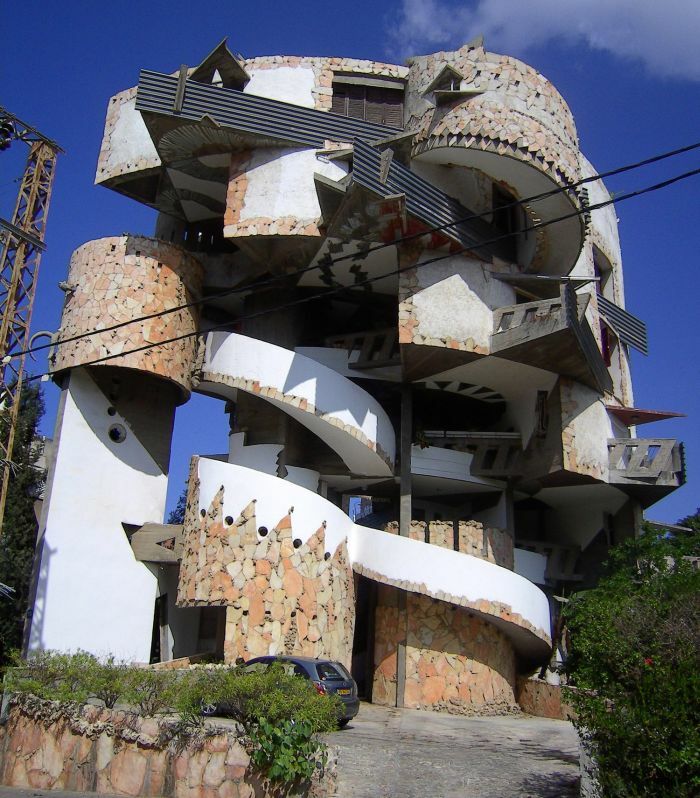 This nine-story postmodernist apartment house, finished in 1985, was designed by Syrian-born architect Leon Gaignebet (also called Leon Geneva). 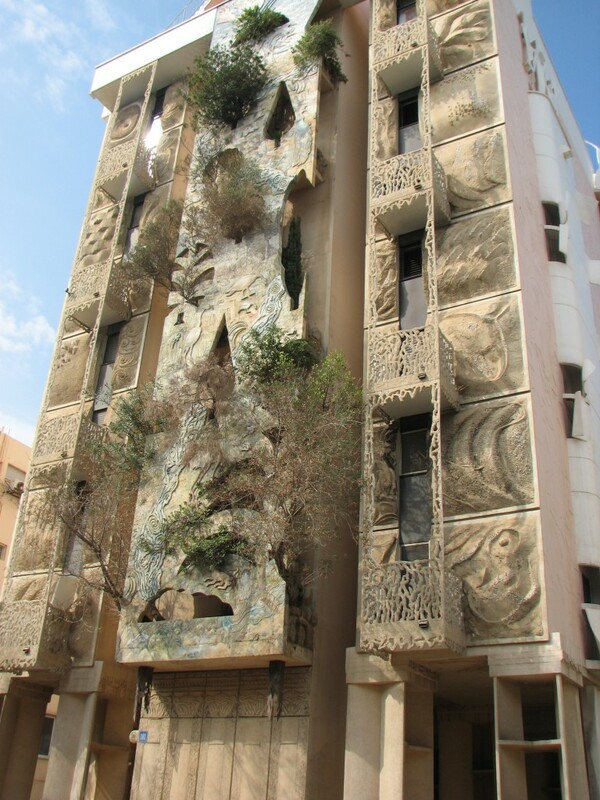 The side of the building that faces the beach is embedded with gravel, shells, sand, natural wood and plants. The front-facing side features a metal-and-concrete fresco. 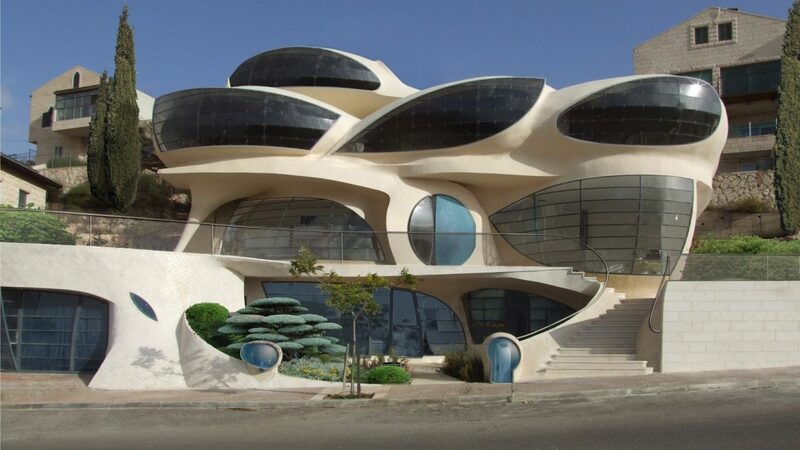 Due to its prime location along Hayarkon Street in north-central Tel Aviv, the Crazy House elicits lots of smiles and picture-taking from visitors to Tel Aviv. The four-story building was never meant to be more than imaginary. 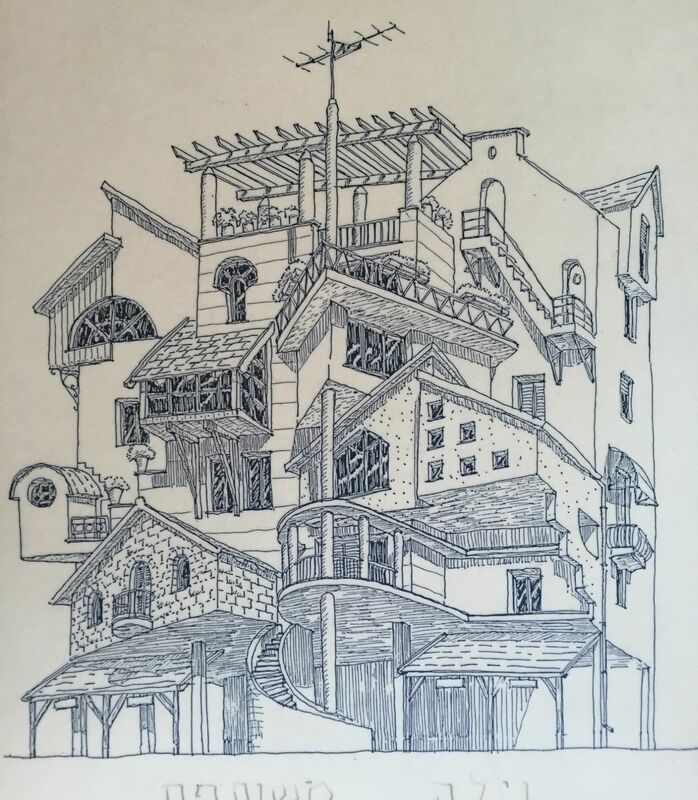 Harel sketched it for a 1980s newspaper column on the renaissance of Tel Aviv culture and art. 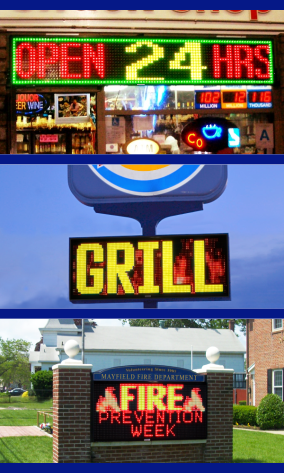 Local entrepreneur Avraham Piltz loved the oddball design and brought it to life, though he died before the house was completed in the mid-1990s. “The idea was that since it was on the shore of Tel Aviv, which in those days was quite neglected, you could be an exhibitionist and expose yourself playfully in front of the sea,” Harel says, pointing out that every room in each of the seven apartments has a sea view. This government office building is meant to evoke a huge boat with inflated sails. Locals call it “The Rocket” because it looks like it’s ready to launch into outer space. 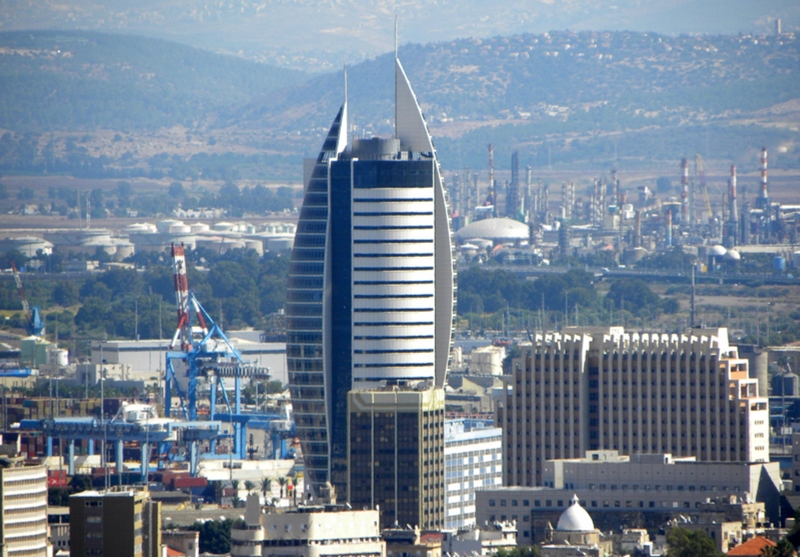 Designed by Dina Ammar, the tower was completed on February 28, 2002 and made Emporis.com’s top 10 list of best skyscrapers that year. The Sail Tower, with 29 above-ground and three below-ground stories, is covered in curtain walls of aluminum and glass. Counting the antennas, it stands at 152.5 meters (500 feet) tall, making it the highest skyscraper in Haifa. In the lobby, 10 steel arcs soar above mosaics depicting Haifa’s history, including a city map from 1773 and a painting of Mount Carmel from 1667. 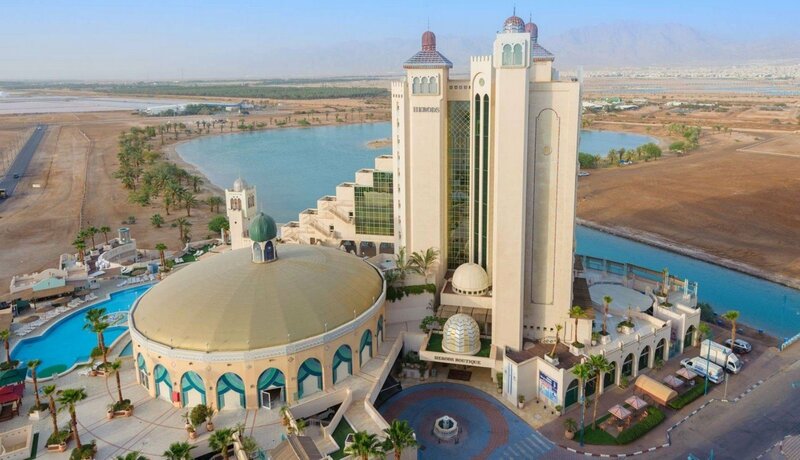 The Herods Eilat Hotels are the brainchild of architect/entrepreneur/sailor Yoav Igra. 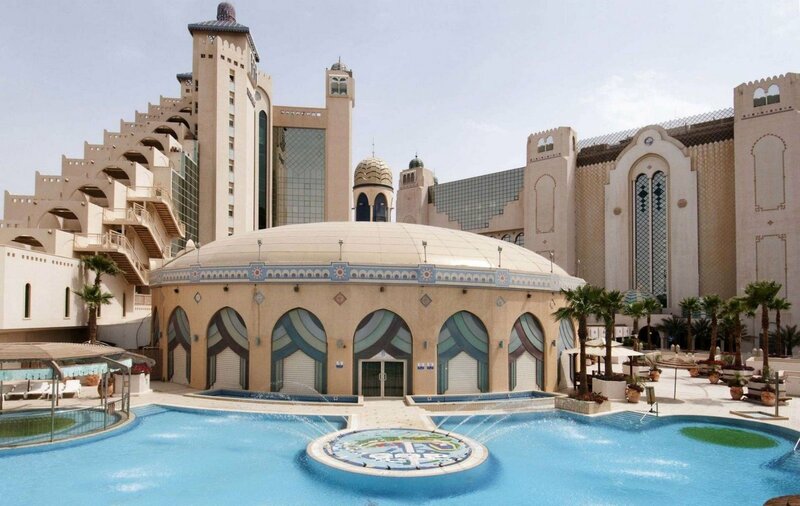 Born and educated in Jerusalem, Igra earned a degree in architecture in Canada and returned to Israel in 1989 to create Israel’s first themed hotel resort similar to those in Las Vegas. The $140 million project is distinguished by historic-looking arches, towers, domes and columns symbolizing seven cultures that had great influence on the region: the Egyptians, Nabateans, Greeks, Romans, Ayyubids, British and Israelis. Igra oversaw each detail down to the doorknobs and structural fittings. The complex of three hotels (Herods Palace for families, Herods Boutique for business travelers and Herods Vitalis spa hotel) opened in 1999. Igra lives in the Palace and continues to update and tweak his creation.